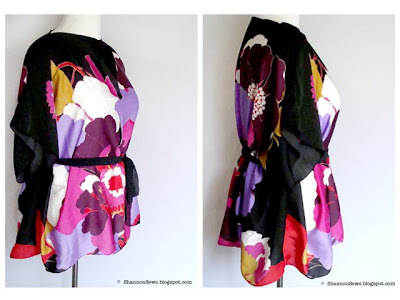 At the beginning of the summer I was on a mission to find 2 coordinating scarves to make into a swanky top, because of this tutorial. 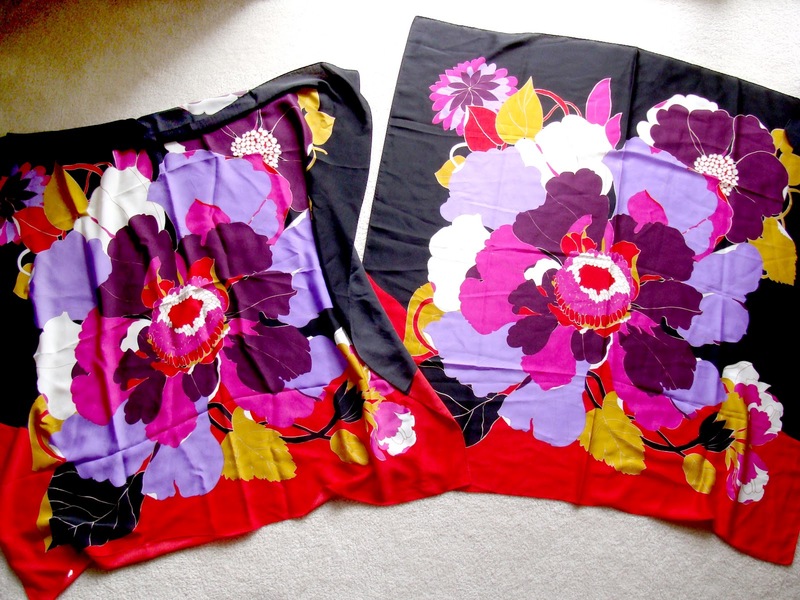 I looked at every thrift store in town, but had a hard time finding them, until I stumbled on two matching scarves. Bonus! They were 35x35 (larger than I wanted), but as it turns out, it's enough to even make a dress! (& a dress, just to show you how it's done). Start by finding 2 coordinating (or matching) scarves. My scarves are a soft polyester. Thrifted: $3.99 each. 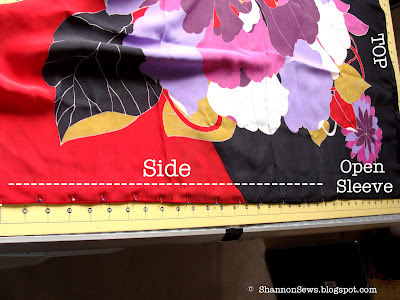 Be sure to set your pressure dial to 1 (so your pressure foot is more gentle on the fabric) and use a small needle (I used a 9) so you don't leave holes in the delicate fabric. 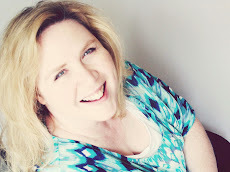 Measure how wide you want your neckline to be. Mine was about 10-11 inches. Put your scarves right sides together. Mark the center. 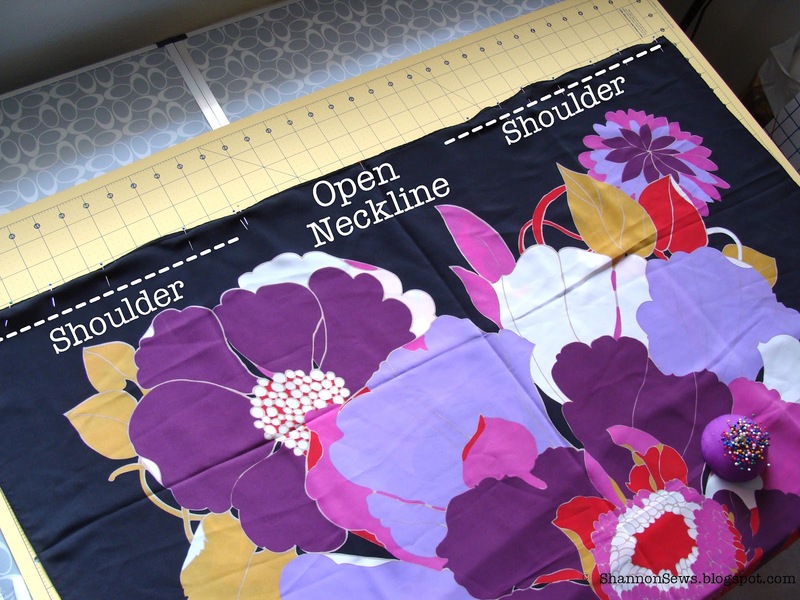 Using the neckline measurement, leave measured space open in the center. 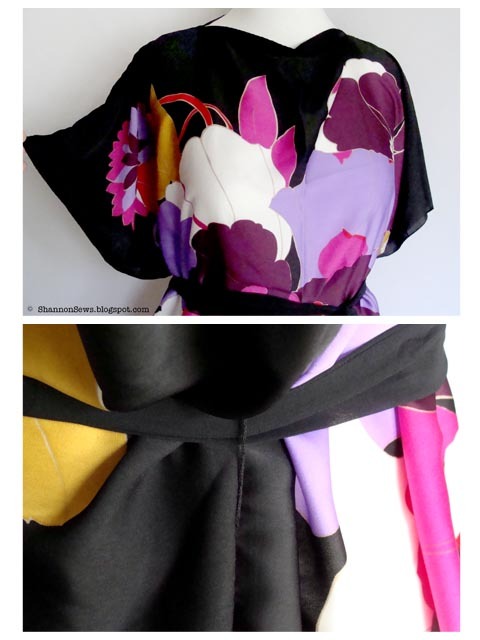 Pin and sew your shoulder seams. 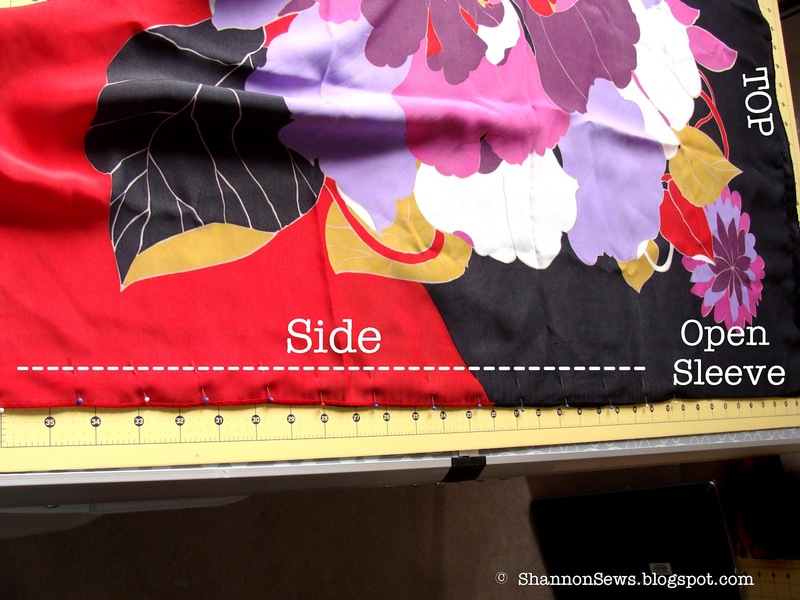 Next, measure how wide you want your sleeve opening to be and mark it so you know when to stop sewing. Pin and stitch from the hemline up to stop mark. THE DRESS: If you wanted to make your scarves into a dress, you're all done (I tied a sash around it). Can you believe how easy that was??!! If I were totally hip I could see myself wearing this as a dress with dark purple leggings and black shoes. Dang it! I'm not quite hip enough...so I'll be doing some trimming and turning it into a shirt instead. 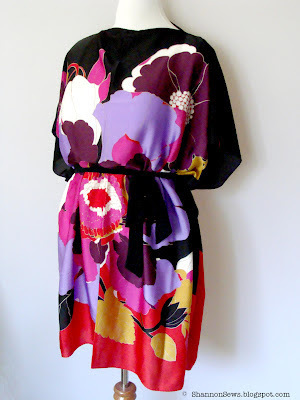 Without defining the waist, its pretty mumu flowy. Some people can totally get away with that, but not me. I'm mumu enough as it is. 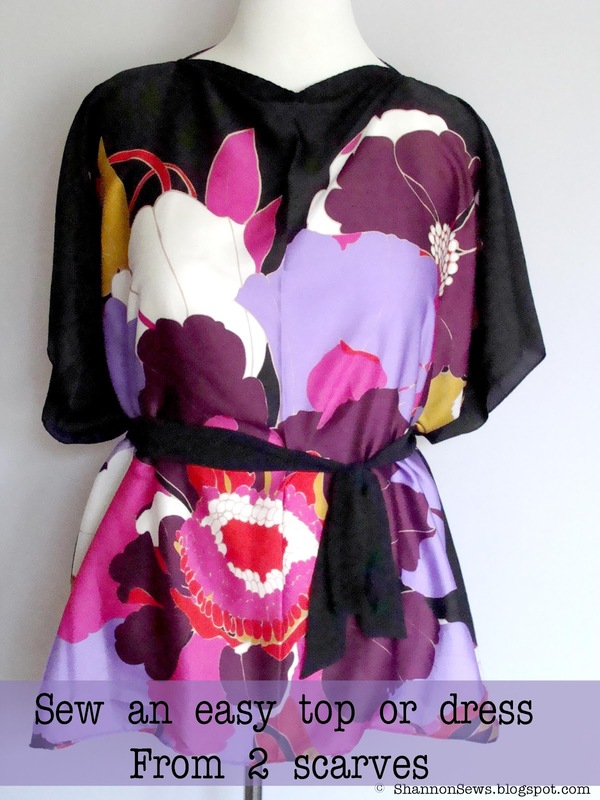 THE SHIRT: To make the dress into a shirt, it really is as easy as it sounds = Cut off the bottom. And hem it. (blah). The purpose of this thrifty project was to find 2 scarves to easily sew into a top. There was to be no hemming. No hemming! It was almost all it was cracked up to be. I ended up cutting off about 6 inches and hemming the bottom. Then I added 2 belt loops on the side, to hold my sash in place (it's still mumu roomy without a sash). I love the flow of it. 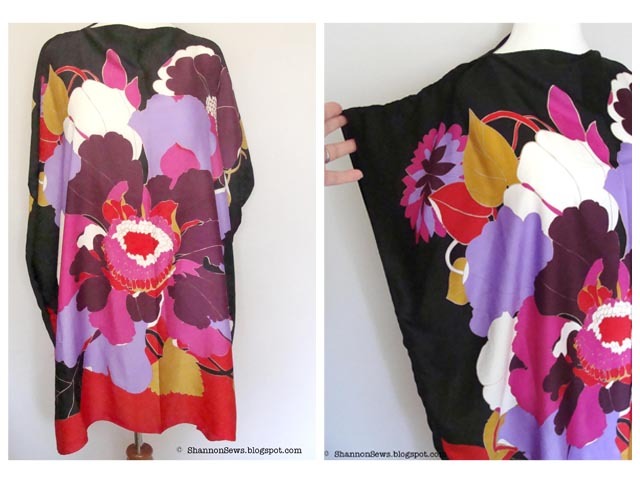 And the flowery colored prints are right on for fall. So feminine and pretty. I think I'll be wearing it with a black pencil skirt. It even created it's own drapey cowl neckline. If you've made yourself a shirt or dress out of a scarf, I'd love to see it! Hi Linda! Thanks so much for your comment! You should totally make one for yourself. It's so easy and if you find 2 coordinating scarves that are more medium sized, you won't have to do any cutting at all. Good luck! I'd love to see it if you decide to make one. LOVE LOVE LOVE THIS!! But how do you find scarves large enough to cover body? I've only ever seen small ones. Maybe i need to pay more attention to the scarf section at tj maxx. Very pretty! The scarves are great thrifting finds! Thanks Jaime! I was lucky to find ones in such good condition - and it was a bonus that they matched! Thanks Meream! It took a while to find the scarves, but I was lucky enough to find a couple of good ones! 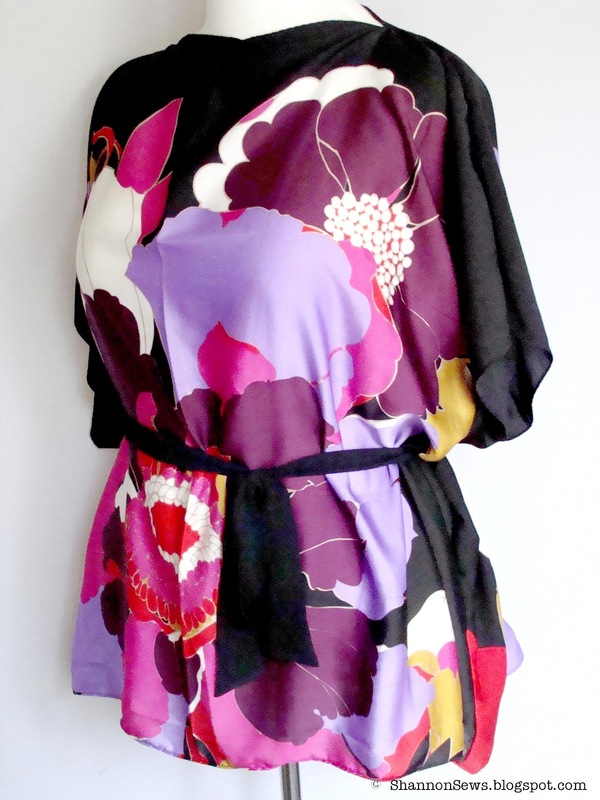 I've looked at this kind of top a few times, but it hadn't occurred to me to use scarves for it. Something else to look for when I'm op shopping :). I didn't realize how easy it would be to make this type of top. Who knew?! :) Thanks so much for stopping by! This really is a neat idea! such a lovely project! im sewing mine this weekend! thanks for sharing! Thanks so much Paula! How did your scarf top turn out? ?